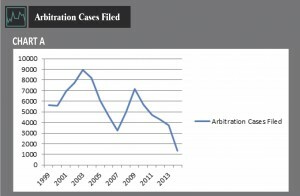 FINRA arbitration, the mandatory dispute resolution forum for brokerage firms, is experiencing an all-time low in new case filings. Positive market conditions have influenced the number of new customer claims filed against registered representatives and FINRA member firms. Generally, case filings decrease when the markets perform well and increase when the markets perform poorly. Obviously, investors who see stable or increased portfolio values do not complain or file claims against their registered representatives or brokerage firms. Nevertheless, should the economy take a downturn in the future, a significant increase in new case filings will likely follow. FINRA arbitration offers certain advantages to its users: it is much quicker than a typical court proceeding and typically more cost-effective. The costs for conducting discovery are generally less than traditional litigation, given the lack of depositions in FINRA arbitration, and the total amount of money spent on arbitration is typically less than State or Federal court. When comparing FINRA arbitrations to State or Federal cases that go to a final hearing, FINRA arbitrations generally reach the merits hearing quicker than trials, thus saving the parties time and money. There are also disadvantages to the FINRA arbitration process for brokerage firms. For example, arbitration does not have formal rules of procedure or evidence and participants run the risk of ending up with an unsophisticated arbitration panel. Arbitrators are not required to be members of the securities industry and they are not required to issue written explanations for their awards unless requested by both parties (which is not typical and rarely occurs). FINRA has precluded class actions from arbitration, but with regard to claims involving large monetary amounts or multiple respondents, we encourage brokerage firms to continue to press for the resolution of these claims in State and Federal court whenever possible. FINRA is a quasi-governmental agency that was created in 2007 through the consolidation of the National Association of Securities Dealers (“NASD”) and New York Stock Exchange Regulation, Inc. (“NYSE Regulation”), the regulatory arm of the New York Stock Exchange, LLC. FINRA arbitration is the primary venue for investors (“customers”) to resolve disputes against their registered representatives and brokerage firms. Alternative dispute resolution is mandatory for all members of FINRA (brokers and brokerage firms). Virtually all brokerage firms include provisions in their standard-form customer agreements requiring the arbitration of customers’ disputes in the FINRA forum. When a client signs a brokerage account agreement, they are submitting to the jurisdiction of FINRA. By all accounts, FINRA arbitration is distinguishable from typical consumer, commercial and other commercial arbitration proceedings because it has the oversight of the Securities and Exchange Commission (“SEC”). The SEC reviews and approves the procedural rules governing the arbitral forum, adding a layer of protection above and apart from the Federal Arbitration Act (“FAA”). However, FINRA arbitration is a less attractive option for brokerage firms than the traditional judicial process and U.S. Courts. Especially in complex cases, FINRA arbitration does not appear to have the necessary apparatus and structure to allow the parties to fully develop and litigate their claims. For example, twenty days before the final arbitration hearing commences, the parties exchange documents they wish to use at the final hearing (which may or may not have been provided during discovery), along with a list of witnesses they intend to call. Arbitrators are not required to follow evidence rules, either State or Federal. The tenor of a typical FINRA arbitration proceeding is much more relaxed and informal than a courtroom hearing and typically takes place in a private conference room. These differences may lead to the likeability of the parties and counsel coming into play, as opposed to in State or Federal Court, where rules govern the content and context of the proceeding. The advantages of litigation to securities firms should entice these firms to seek to litigate matters in either State or Federal court when both parties will agree to opt out of arbitration. As discussed above, the advantages to formal litigation are numerous; the arbitration panel may not have anyone with securities experience or understand the subject matter of the dispute, the panel may not follow formal rules of evidence and the parties may not have an opportunity to fully develop their cases during discovery. Case filings are at an all-time low, based on statistics maintained by FINRA. When compared to the overall U.S. economy (based on the Standard and Poor 500 economic index), the number of filings directly correlates to the market conditions. After rising 65% from the same period in 2008 and spiking at a high of 7,137 claims in 2009, case filings have now leveled off to an all-time low (3,714 in 2013 and 1,344 through April 2014). This spike in filings in 2009 and continuous drop off during the following years mirrors the Great Recession which took place in the latter part of 2008. This rise and fall in claims filing is easy to understand when looking at the overall economic picture; when the economy is doing well, customers are less likely to sue their broker. In the short term, we can expect that this trend will continue. If and when the current economic expansion ends, we can expect an increase in the filing of FINRA arbitration claims. (See Charts “A,” “B” and “C,” showing the economic index, FINRA dispute statistics, and trends in the types of claims filed over time). Given the drop-off in claims submitted to FINRA arbitration and the correlation to market performance, savvy brokerage firms should monitor and track economic forecasts to determine when to reserve for increased litigation and arbitration costs. Based on current trends, when the securities market dips, FINRA arbitration claim filings will again rise. Firms that have reserved appropriately will have the ability to weather the storm to deal with increased litigation. Does Your Exculpatory Contract Say The Magic Words? Cole, Scott & Kissane has highly trained attorneys who focus on the defense of the fitness, travel and entertainment industries. Quite often, these industries offer facilities or services to the public or to private members that involve a heightened risk of sustaining personal injuries. As a means of reducing potential exposure to personal injury claims, our clients often require patrons or guests to sign membership contracts or release agreements that contain exculpatory clauses purporting to limit liability for personal injuries sustained by the patron or guest. Did the plaintiff personally sign the contract containing the exculpatory clause? Was it signed before the injury occurred? If the answer to any one of those questions was “no,” then the likelihood of prevailing on such a defense was, in most circumstances, practically nil. I/we hereby release Give Kids the World, Inc. and all of its agents, officers, directors, servants, and employees from any liability whatsoever in connection with the preparation, execution, and fulfillment of said wish, on behalf of ourselves, the above named wish child and all other participants. The scope of this release shall include, but not be limited to, damages or losses or injuries encountered in connection with transportation, food, lodging, medical concerns (physical and emotional), entertainment, photographs and physical injury of any kind . . .
(Emphasis added.) While at the resort, Ms. Sanislo stepped onto a wheelchair lift that malfunctioned, causing her to fall and sustain injuries to her hip and back.10 Ms. Sanislo filed suit. Give Kids the World, Inc. filed a motion for summary judgment based upon the language of the exculpatory clause, which the trial court denied.11 The Sanislos prevailed at the trial court level and Give Kids the World, Inc. appealed.12 The Fifth District Court of Appeal, rejecting decades of jurisprudence from Florida’s other District Courts of Appeal, reversed the trial court’s denial of the defendant’s motion for summary judgment and found that the language of the exculpatory clause was unambiguous and enforceable, despite the lack of any reference to the terms “negligence” or “negligent acts.”13 This presented a conflict among the District Courts of Appeal on an important issue of law. Although Sanislo appears on its face to broaden the enforceability of pre-injury releases, the fact remains that exculpatory clauses are in derogation of common law and public policy and will, therefore, continue to be strictly construed by our courts. In fact, the United States District Court for the Southern District of Florida has already observed that Sanislo may have limited applicability based upon the Florida Supreme Court’s note that it was important to its decision that the activities at issue in the Sanislo case “were not inherently dangerous.”16 Nonetheless, Sanislo represents a significant and perhaps promising departure from decades of jurisprudence that could have a positive impact on the fitness, travel and entertainment industries’ abilities to limit potential exposure to personal injury claims. 1 Applegate v. Cable Water Ski, L.C., 974 So.2d 1112, 1114 (Fla. 5th DCA 2008). 2 Ivey Plants, Inc. v. FMC Corp., 282 So.2d 205, 208 (Fla. 4th DCA 1973). 3 Cain v. Banka, 932 So.2d 575, 578 (Fla. 5th DCA 2006). 4 Levine v. A. Madley Corp., 516 So.2d 1101 (Fla. 1st DCA 1987); Van Tuyn v. Zurich Am. Ins. Co., 447 So.2d 318 (Fla. 4th DCA 1984); Goyings v. Jack & Ruth Eckerd Found., 403 So.2d 1144 (Fla. 2d DCA 1981). 6 Sanislo v. Give Kids the World, Inc., 157 So.3d 256 (Fla. 2015). 16 Salas v. Schachter, 2015 WL 7007803, at *2 (S.D. Fla. 2015) quoting Sanislo, 157 So.3d at 271. By Melissa D. Crowley, Esq. As the prevalence of sending emails, texting, posting on social networks, and making calls from smartphones while driving has increased, the legal implications for doing so has increased as well. One government study found that more than two-thirds of adult drivers in the United States reported talking on their cell phones while driving and nearly one-third of United States adult drivers sent or read a text or email while driving in the preceding thirty days.1 In 2014, the National Safety Council reported that cell phone use while driving causes distractions that result in over 1 in 4 car accidents in the United States.2 Not surprisingly, a simple internet search reveals a number of plaintiff’s attorneys who advertise that it may be possible in some cases to make a punitive damages claim against a driver when use of a cellular device at the time an accident becomes evident. In 1994, the Florida Supreme Court held that punitive damages are only appropriate when a defendant engages in conduct that is “fraudulent, malicious, deliberately violent or oppressive, or committed with such gross negligence as to indicate a wanton disregard for the rights of others.”3 Later, in 1997, Florida’s Legislature set forth the criteria necessary to plead a punitive damages claim and the pertinent burden of proof in civil cases. These are found in Section 768.72(1) & (2), Florida Statutes. In order to state a claim for punitive damages, the plaintiff must first seek leave of court in accordance with the statute. Section 768.72(1), Florida Statutes. When considering whether or not to grant leave to amend, our courts must first ask whether the plaintiff has demonstrated “a reasonable showing by evidence in the record or proffered by the claimant which would provide a reasonable basis for recovery of such damages.” Id. Thereafter, if the court permits the punitive damages claim, then the trier of fact must find the defendant driver personally guilty by clear and convincing evidence of “intentional misconduct” or “gross negligence” in order to warrant an award of punitive damages.4 Section 768.72(2), Florida Statutes. Then, after the plaintiff proves entitlement to a punitive damages award, the jury must apply the “greater weight of the evidence” burden of proof in determining the amount of the punitive damages award. Section 768.725, Florida Statutes (1999). Lindsey v. Clinch County Glass, Inc., 718 S.E. 2d 806 (Ga. Ct. App. 2011): holding an injured driver could not recover punitive damages against an at-fault driver who caused an accident even after the driver admitted he was distracted while looking up a number on his mobile phone at time of accident. Thompson v. Cooper, 290 P.3d 393 (Alaska 2012): disallowed punitive damages despite evidence showing the at-fault driver was speeding, talking on his phone, impaired by Parkinson’s disease, under the influence of medication, and failed to use required eye-wear at time of accident. Southard v. Belanger, 966 F. Supp. 2d 727, 739 (W.D. Ky. 2013): denying plaintiff’s claim for punitive damages despite allegations the defendant was talking while using a hands free device at time of impact. Ellis v. Old Bridge Transp., LLC, 4:11-CV-78 CDL, 2012 WL 6569274 (M.D. Ga. 2012): precluding a claim for punitive damages for talking on the phone and driving because clear and convincing evidence showing a pattern or policy of dangerous driving was not found. Sipler v. Trans Am Trucking, Inc., CIV. 10-3550 DRD, 2010 WL 4929393 (D.N.J. 2010): granting defendant’s motion for summary judgment on plaintiff’s claims for punitive damages based on allegations that defendant was talking on a hands-free cell phone at time of accident. Anderson v. Foglesong, A09-453, 2009 WL 4910489 (Minn. Ct. App. 2009): denying plaintiff’s motion to amend to add punitive damages based on an allegation the defendant admitted to reaching for her cell phone at time of accident. Even though the fact that Florida’s appellate courts have yet to decide whether a claim for punitive damages based upon a driver’s cell phone is viable, there is certainly increased awareness, research, and reports of such drivers causing accidents that result in damages and injuries. Therefore, until Florida’s law is clear, we should anticipate that plaintiff’s attorneys and their experts will likely request leave to plead punitive damages in cases where there is evidence of unlawful cell phone use while driving with catastrophic injuries. Counsel and their experts will analogize cell phone use while driving to that of driving under the influence of alcohol, for which Florida law does allow the imposition of punitive damages.8 Experts can easily support the analogy since, according to the National Highway Traffic Safety Administration, driving a vehicle while texting is six times more dangerous than driving while intoxicated. While there is currently no law in Florida that makes cell phone use while driving a criminal act, the Florida Legislature did enact the Florida Ban on Texting While Driving Law in 2013.13 Section 316.305, Florida Statutes, forbids the operator of a motor vehicle from “manually typing or entering multiple letters, numbers, symbols, or other characters into a wireless communications device or while sending or reading data on such a device for the purpose of non-voice interpersonal communication, including, but not limited to, communication methods known as texting, e-mailing, and instant messaging.”14 Violation of this statute constitutes a traffic infraction, not a criminal offense.15 However, in asserting a claim for an award of punitive damages, plaintiff’s attorneys will likely argue that violation of Section 316.305, Florida Statutes, or the unlawful use of a cell phone, is evidence of intentional misconduct or gross negligence. The law in Florida as to whether a plaintiff may assert a punitive damages claim where evidence exists of the defendant driver’s unlawful cell phone use at or about the time of accident, therefore, remains uncertain. Attorneys and insurers should anticipate that plaintiff’s counsel will sometimes seek leave to plead a punitive damages claim where there is evidence of unlawful cell phone use. In evaluating and defending these claims, it would be wise to gather information that relates to cell phone use early during the investigation phase of a claim. Nonetheless, even when the relevant conduct does not rise to the level of intentional misconduct or gross negligence necessary to proceed with a punitive damages claim, the defendant driver may still be found negligent. If a jury determines that the defendant driver was negligent as a result of unlawful cell phone use, an insurer may be obligated to provide coverage for any judgment against its insured that does not exceed the applicable policy limits. Therefore, whenever possible, insurers and defense attorneys should assess to what extent an insured’s unlawful cell phone use while driving might result in a determination of negligence. Not only may a jury determine that an insured’s unlawful cell phone use while driving constituted negligence, but such proof could possibly also result in a jury’s enhancement of a compensatory damages award irrespective of whether the court allows the plaintiff to assert a punitive damages claim. 1 See Gunning, Patrick, Seeking Punitive Damages against Drivers Distracted by HandHeld Electronic Devices, Journal of Consumer Attorneys Association for Southern California Advocate, April 2014 (citing Naumann, Rebecca B. et al. Mobile Device Use While Driving – United States and Seven European Countries). In this study, adult drivers are identified as drivers aged 18-64. 2 In 2014, the National Safety Council reported the annual estimate of cell phone crashes for the year 2013. The study shows that more than a quarter of all car crashes in America, or a minimum of 27%, are likely caused by drivers talking and texting on cell phones. The NSC model estimated that 21% of crashes in 2013, or 1.2 million crashes, involved talking on handheld and hands-free cell phones, and an additional 6% or more of crashes in 2013, or a minimum of 341,000 crashes, involved text messaging. See nsc.org. Also see Distracted Driving: Facts and Statistics at distraction.gov, the official US Government website for distracted driving; and see Injury Prevention & Control: Motor Vehicle Safety, Distracted Driving found at cdc. gov, the website for the Centers for Disease Control and Prevention. 3 See W.R. Grace & Co.-Conn. v. Waters, 638 So.2d 502, 503 (Fla. 1994). 4 The plaintiff’s burden of proof in making a claim for punitive damages must be satisfied by clear and convincing evidence, which is higher than the preponderance of the evidence standard required to prove negligence, but less than the beyond a reasonable doubt standard required in criminal cases. 5 Margaret S. Caskey, et al. vs Astellas Pharma US, Inc. et al., Collier County Case No. : 112010CA0005820001XX (Fla. Collier Cir. Ct. 2011). (Note that the Second District Court of Appeal denied appellants’ motion requesting issuance of a written opinion, Astellas Pharma US, Inc. v. Caskey, 88 So.3d 157 (Fla. 2DCA 2012)). 7 See Swift, Aisling, Collier Judge Allows Enhanced Damages in Suit Alleging Driver was Texting in Fatal Crash, Naples Daily News, November 6, 2011, available at http://www. naplesnews.com/news/crime/texting-driving-collier-punitive-damages-fatality. 8 Ingram v. Pettit, 340 So.2d 922 (Fla. 1976). 11 Fla. Stat. § 316.193. 12 Cf. Southstar Equity, LLC v. Lai Chau, 998 So.2d 625 (Fla. 2d DCA 2008) (upholding a punitive damages award for non-criminal conduct in action involving intentional misrepresentation and gross negligence in providing security). 13 Fla. Stat. § 316.305. 16 Id. § 768.72(3) (detailing the instances where punitive damages may be imposed against an employer, principal, corporation, or other legal entity for the conduct of an employee or agent). Once a determination is made that the “right and duty to defend the insured against any “suit” exists under the policy, the question becomes whether the insured is entitled to counsel of its choice, or at least “mutually agreeable counsel.” Strictly speaking, within the confines of the standard CG 00 01 insuring agreement, the answer is “NO”. The standard CGL policy provides no entitlement for an insured to hire legal counsel of its choosing at the expense of the insurer. However, the manner in which the insurer acts upon this duty to defend may alter the parties’ obligations and unwittingly create new rights and obligations in both the insurer and the insured. This is particularly true where the insurer provides notice that the defense will be provided under a “Reservation of Rights” – a notification to an insured that coverage for a claim may not apply.9 This notification allows an insurer to investigate, or even defend, a claim to determine if coverage applies, without waiving its right to later deny coverage based on information revealed during the investigation.10 The entitlement of an insurer to defend under a Reservation of Rights does not arise from the language of the policy itself. Rather, the insurer’s entitlement to defend must arise by operation of statute or a contractual relationship independent of the insuring agreement. A “coverage defense” is “a defense to coverage that otherwise exists,”12 examples of which include a failure to cooperate or a failure to provide timely notice of claims. However, coverage defenses do not include a disclaimer of liability based upon an express exclusion in the policy.13 It follows, then, that an insurer is not statutorily obligated under the Claims Administration Statute to issue a Reservation of Rights where coverage may simply be excluded by the terms of the insuring agreement. Insurers often provide notice that a defense will be provided pursuant to a Reservation of Rights despite the absence of any correlation with an asserted “coverage defense” under the Claims Administration Statute. In such cases, the Reservation of Rights does not fall within the framework of Claims Administration Statute, and by its express terms should not implicate the insured’s statutory right to “mutually agreeable counsel.” Instead, the Reservation of Rights operates more so as a reminder to the insured that the duty to defend is honored, but subject to the terms, conditions and exclusions set forth in the policy. Nevertheless, insurers should be cautious because this approach could still bind the parties to the insuring agreement to new and previously uncontemplated rights and obligations. A Reservation of Rights in such circumstances is not provided pursuant to any statutory requirement or a requirement of the policy. Therefore, a separate contractual relationship with entirely new obligations might arise; and an insured’s right to mutually agreeable counsel could ultimately be grounded in these new contractual terms. Thus, the insurer must be careful to ensure that all terms contained in the Reservation of Rights are clearly stated, and that both the insured and the insurer have a clear understanding of all terms. Where a duty to defend is triggered, no right exists under a standard CG 00 01 insuring agreement for an insured to select counsel of its choice, or otherwise insist on the selection of “mutually agreeable counsel.” Rather, the Legislature created the insured’s right to select counsel under the strict and limited circumstances that arise under Florida’s Claims Administration Statute. However, Florida Courts continue to generate an ever-expanding minefield of ambiguity and uncertainty where insurers tender Reservations of Rights outside the context of an insurer’s statutory obligations. It is, therefore, vital that adjusters, attorneys and insurers understand and properly consider the possible implications of electing to provide a Reservation of Rights as a “reminder” to the insured as to the terms, conditions and exclusions under the policy, or of deciding to forego a Reservation of Rights notice to the insured. 1 Altman Contractors, Inc. v. Crum & Forster Specialty Ins. Co., No. 13-80831-CIV, 2015 WL 3539755 (S.D. Fla. June 4, 2015). 2 Auto–Owners Ins. Co. v. Anderson, 756 So. 2d 29, 34 (Fla. 2000). 3 See Fla. Farm Bureau Ins. Co. v. Birge, 659 So. 2d 310, 312 (Fla. 2d DCA 1994) (Parker, A.C.J., dissenting) (citing Jefferson Ins. Co. of N.Y. v. Sea World of Fla. Inc., 586 So. 2d 95 (Fla. 5th DCA 1991)); U.S. Liab. Ins. Co. v. Bove, 347 So. 2d 678 (Fla. 3d DCA 1977). 4 Altman Contractors, Inc., No. 13-80831-CIV, 2015 WL 3539755. 5 See Black’s Law Dictionary 300 (10th ed. 2014). 6 Raymond James Financial Services, Inc. v. Phillips, 126 So. 3d 186, 190 (Fla. 2013). 7 Altman Contractors, Inc., 2015 WL 3539755. 8 Id. ; see also North Pointe Cas. Ins. Co. v. M&S Tractor Services, Inc., 62 So. 3d 1281, 1282-83 (Fla. 2d DCA 2011) (noting that only if the relevant policy language is susceptible to more than one reasonable interpretation – one providing coverage and the other limiting coverage – is the insurance policy considered ambiguous). 9 See Glossary of Insurance Management Terms (9th ed.). 11 Fla. Stat. §627.426(2)(a) (2014) (emphasis added). 12 See AIU Ins. Co. v. Block Marina Inv., Inc., 544 So. 2d 998, 1000 (Fla. 1989). 13 See Travelers Indemn. Co. of Ill. V. Royal Oaks Enter., Inc., 344 F.Supp. 2d 1358, 1369-70 (M.D. Fla. 2004). 14 Fla. Stat. § 627.426(2)(b) (emphasis added). 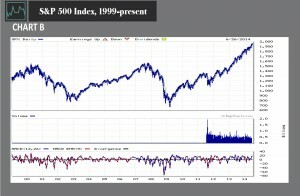 15 See Int’l Risk Management Institute (2004); see also American Empire Surplus Lines Ins. Co. v. Gold Coast Elevator, Inc., 701 So. 2d 904, 906 (Fla. 4th DCA 1997). 16 American Empire Surplus Lines Ins. Co., 701 So. 2d at 906. 22 Id. (citing Steil v. Florida Physicians Ins. Reciprocal, 448 So. 2d 589 (Fla. 2d DCA 1989)). 23 777 So. 2d 1034 (Fla. 1st DCA 2000). 24 Id. at 1036. (emphasis added). 27 Cigarette Racing Team, Inc. v. Parliament Ins. Co., 395 So. 2d 1238, 1239-40 (Fla. 4th DCA 1981). By Kathryn L. Ender, Esq. Proposals for settlement have become common-place in litigation as a strategic means to engage settlement, and as a feeshifting mechanism in the event settlement reaches impasse. Florida Rule of Civil Procedure 1.442 governs the content of proposals for settlement. Although a rule of procedure, the Florida Supreme Court has definitively held that it must be strictly construed due to its penal implications.1 However, what used to be strict construction based upon a reasonable interpretation of the statute has morphed into an imbalanced treatment of the rule’s provisions at the behest of strict construction.2 The result is inconsistent application of the rule’s provisions by the Florida courts; thereby invalidating otherwise unambiguous proposals for settlement, and leaving counsel and claims professionals to speculate as to what is sufficient to satisfy the rule’s requirements. Notably, the impact of this yet-to-be resolved conflict is that there are likely many pending proposals for settlement that would be unenforceable if the Florida Supreme Court adopts the First District Court of Appeal’s analysis. Given this present legal conflict, it is prudent for counsel and claims professionals to be mindful of the Florida courts’ ever-increasing scrutiny, and strictly adhere to the rule’s requirements. The Florida Supreme Court’s consideration of this issue is necessary in order for Rule 1.442 to maintain its utility. While we await the outcome of the Florida Supreme Court’s decision on the certified question in Kuhajda, counsel and claims professionals should remain cognizant of this conflict in the law and ensure their proposals comply with the First District Court of Appeal’s more strict interpretation of Rule 1.442’s requirements. Additionally, a renewed evaluation of pending proposals for settlement may help ensure litigation goals are reached by confirming the proposals satisfy the rule’s requirements, and by allowing new proposals to be served in cases where they do not. 1 Willis Shaw Express, Inc. v. Hilyer Sod, Inc., 849 So.2d 276 (Fla. 2003). 2 Cf. State Farm Mut. Auto. Ins. Co. v. Nichols, 932 So.2d 1067, 1070 (Fla.2006) (requiring a proposal merely to be “sufficiently clear and definite to allow the offeree to make an informed decision without needing clarification”); Diamond Aircraft Indus., Inc. v. Horowitch, 107 So.3d 362, 377-78 (Fla. 2013) (holding that, under the facts of that case, the party’s failure to include a provision of rule 1.442 created an ambiguity by omission). Compare Bennett v. American Learning Systems of Boca Delray, Inc., 857 So.2d 986 (Fla. 4th DCA 2003) (hereinafter “Bennett”) (“The purpose of the rule is to provide an efficient mechanism to convey an offer of settlement to the opposing party free from ambiguities so that the recipient can fully evaluate its terms and conditions.”), and Three Lions Construction, Inc. v. The Namm Group, Inc., 2015 WL 4464494, at *1 (Fla. 3d DCA July 22, 2015) (hereinafter “Three Lions”) (holding that a proposal satisfied the requirements of Diamond Aircraft even though it did not track the language of Rule 1.442(c)(2)(F)), with Borden Dairy Company of Alabama, LLC and Major O. Greenrock v. Susanne L. Kuhajda, 171 So.3d 242, at 243 (Fla. 1st DCA 2015) (hereinafter “Kuhajda”) (concluding that the test is “strict compliance, not the absence of ambiguity”). 3 Suzanne L. Kuhajda v. Borden Dairy Co. of Alabama, LLC and Major O. Greenrock, 2015 WL 8204268, SC15-1682 (Fla. Nov. 30, 2015); see also Colvin v. Clements and Ashmore, P.A. d/b/a North Florida Women’s Care, 2015 WL 167010 (Fla. 1st DCA Jan. 15, 2016) (relying on Kuhajda to find a proposal unenforceable and certifying same conflict to Florida Supreme Court). 4 Bennett, 857 So.2d at 986; Three Lions, 2015 WL 4464494, at *1. 5 Bennett, 857 So.2d at 986 (holding that the proposal does not have to state whether it “includes attorneys’ fees and whether attorneys’ fees are part of the legal claim” in a case in which the plaintiff’s complaint did not contain a plea for attorneys’ fees), with Kuhajda, 171 So.3d at 243 (holding that the proposal does have to state whether it “includes attorneys’ fees and whether attorneys’ fees are part of the legal claim” in a case in which the plaintiff’s complaint does not contain a plea for attorneys’ fees, and certifying the issue as a conflict for determination by the Florida Supreme Court). 6 Kuhajda, 171 So.3d at 243. 7 Fla. R. Civ. P. 1.442(c)(2)(F). 8 Kuhajda, 171 So.3d at 242. 12 Id. (quoting R.J. Reynolds Tobacco v. Ward, 141 So.3d 236, 238 (Fla. 1st DCA 2014)). 13 Id. (certifying conflict with Bennett). 14 Bennett, 857 So.2d at 988. 16 Jacksonville Golfair, Inc. v. Grover, 988 So.2d 1225, 1227 (Fla. 1st DCA 2008). 17 Nichols, 932 So.2d at 1078. 18 Alamo Financing, L.P. v. Mazoff, 112 So.3d 626, 629 (Fla. 4th DCA 2013) (quoting Carey-All Transp., Inc. v. Newby, 989 So.2d 1201, 1206 (Fla. 2d DCA 2008)). 19 Cf. Miley v. Nash, 171 So.2d 145 (Fla. 2d DCA 2015) (holding that a proposal resolving “all claims” sufficiently identified the claims to be resolved without specifically identifying the consortium claim, and explaining that “[t]he wording of these conditions does not create any ambiguity as to what the effect of accepting the proposal will be.”), cert. denied 2015 WL 9306766 (Fla. Dec. 18, 2015); Three Lions, 2015 WL 4464494, at *1 (observing that a proposal for settlement satisfied the requirements of Diamond Aircraft where it simply stated that the “proposal includes any attorney fee claim [the offeree] may have against [the offeror]” and did not track the language of Rule 1.442(c)(2)(F)).